Whenever I hear that overtime is approved at my day job, I either cringe a little bit, or roll my eyes while making sure no one else is looking my way. It’s not that I don’t appreciate my job and option of being able to receive overtime pay (which is time and a half). It’s just that deep down, I know my job requires a lot of mental energy, and I prefer not to spend more than 40 hours per week working there. Depending on what your job is, the average person gets drained after working so many hours doing the same thing. Almost every time, I pass on working overtime, but I do utilize other options to earn extra money. Relying on overtime isn’t sustainable because you never know when it will be available to you – your employer could just stop offering it. 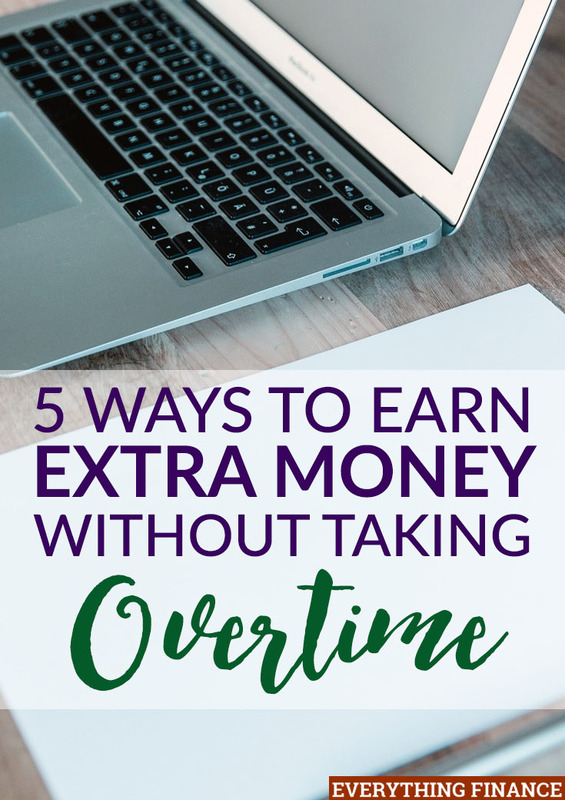 If you’d rather stick to your regular schedule and avoid overworking yourself at your day job, here are 5 ways to earn extra money without overtime. Instead of trying to work extra hours, consider earning more for the same amount of work you are currently doing. That way, you will be less likely to get overwhelmed and burnt out by working so many hours. If you have an annual review at your job or haven’t received a raise in while, bring up the conversation with your boss and see what their thoughts are. Maybe there’s a promotion you can apply for or you can demonstrate all the benefits your work has brought the company since you’ve joined the team to help convince your employer. Either way, securing a raise is much better than working tirelessly to earn more money, but the first step is to ask. If you receive an annual or quarterly bonus, you can also use that to your advantage. If you work diligently each week to meet your goals and obtain your bonus, you’ll have the extra money you desire without taking overtime. My employer offers a bonus every month as long as our team reaches our goal. This means there’s no need for me to want to pick up extra hours because if I work diligently to reach my goals each month, I’ll always have extra money on my paycheck. Direct sales gets a bad reputation at times because some people confuse it with pyramid schemes. On the contrary, you can make honest money (not millions) with legitimate direct sales companies like Avon, Mary Kay, Stella & Dot, the Pampered Chef, etc. if you simply hand out your catalogues to coworkers, friends, and family members who would be interested in the products you represent. It’s not always consistent or predictable money, but it will help you earn extra money nonetheless and you’ll score free products. Plus, it’s a lot more interesting than working late into the evening at your day job. Instead of getting a second job, start working for yourself by marketing specific skills and services you have to others. You can tutor, give lessons, write content, design graphics, help with marketing and PR, take professional photos, run a photo booth at events, set up websites, do bookkeeping, or prepare taxes during your spare time. The list literally goes on and on, and the best thing about side hustles is that you can determine when you want to work and how much money you earn. By setting your own rates and booking your own work, you’ll have a lot more responsibility, but you’ll also have a lot more control over your income as well. If you don’t have the time or desire, you don’t need to start a big legitimate side business, either. You can simply donate plasma on weekends, pet sit on nights when you’re available, or sell old items in your home online. Side hustling helps provide a great creative outlet for most people and allows you to diversify your income so you aren’t relying on one single income source. Don’t forget to use a good online accounting software to keep things in order. Depending on your situation and your living arrangements, getting a roommate or renting out part of your home will help you either save money or receive an extra source of income if someone is paying you rent. If you have the space, having a roommate who is responsible and trustworthy is always a good financial move because you can split basic living expenses and utility bills to keep more money in your pocket. If you have a guest room or basement, renting it out to a tenant can help you earn extra money to meet some of your financial goals without having to put too much work in. Working full-time can make you pretty beat, so it’s nice to establish ways to bring in extra money that don’t require much of your time. The main thing I don’t like about overtime is that it eats away at your time. If you are trying to establish a healthy work-life balance, but need the extra money, it can be a tough call to make. If you’re like me and you’d choose any of these options over picking up overtime, you’re not alone. According to a study by Fidelity Investments, millennials would rather earn less or take a $7,600 pay cut to receive a better work-life balance. I don’t doubt that other generations have similar views because time is something you can’t get back, so it’s important to ensure you earn enough working full-time so you don’t have to give up additional time that could be spent relaxing or pursuing other things. Do you think the benefits of working overtime outweigh the costs or disadvantages? Would you utilize any of these options?